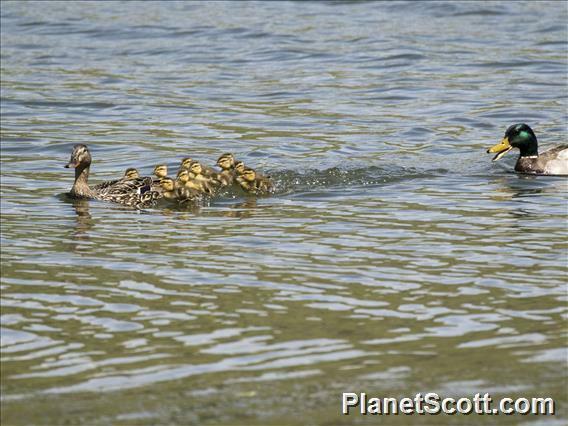 Mallards are undoubtedly the most recognized waterfowl in the world. They have a typical duck body with an iridescent blue patch on the wings in both sexes. On males the notable characteristics are the green iridescent feathers on the head and neck and curled black feathers on the tail. Females are uniformly a speckled brown color. The male duck's bill is yellow, while the female's bill is orange with black markings. Both males and females have orange legs, webbed feet, and dark colored eyes. Average basal metabolic rate: 4.068 W.
Seen from train between Airport and center. 4 adults and many offspring in one of the ponds. At least on in the flock of ducks and swans. Lots of Mallard/Grey Duck Hybrids.